Yes, Jennie, The Pig Roast and Pie Wheel is almost here and we will have a Raspberry Pie!!! Save the Date! 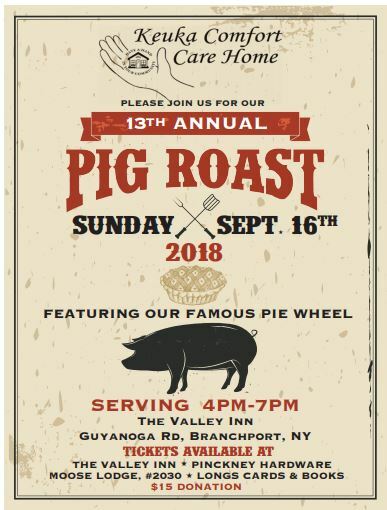 This years Pig Roast and Pie Wheel will be held Sunday, Sept. 16th at The Valley Inn. Roast Pig, Salads, Rolls… for a $15 donation. And of course the Pie Wheel! Last year we raffled off over 50 pies of every assortment you could imagine!!! Kim Heitmann is our new chairperson and has done a great job getting everything set for an afternoon of fun! If you are interested in helping us that day, please stop by Keuka Comfort Care Home and let him know you’d like to help. Keuka College is sending a few of their students out to help set up the tables and chairs and take them down. Last year we had almost 400 people come and spend the afternoon with us, so that is a lot of work getting set up. We don’t know what we would do without them! Maureen Wise is looking for pie bakers. If you are known for your pie baking skills and would like to donate a pie for the Pie Wheel, contact Maureen at events@keukacomfortcarehome.org or call Keuka Comfort Care Home at 315-536-1690. We have pie boxes available at KCCH for you to pick up if you need them to transport your pie. We ask you to label your pie and list any ingredients that may be an allergen to someone. There is refrigeration on site, so cream pies are welcome. We will also take gift certificates for a pie if you are a business and would like to make a donation that way. If you are interested in joining next years pig roast committee, email events@keukacomfortcarehome.org and let us know your intention or better yet, come to this years pig roast and find Kim Heitmann and say hello! It is a fun group and we would love to have you join us. We will need someone to help us keep track of the tickets and ticket sellers. If you would like to learn more about Keuka Comfort Care Home, a two-bedroom palliative care home for our terminally ill, please visit our website: www.keukacomfortcarehome.org, our Facebook page or give us a call at 315-536-1690. We would be happy to hear from you and have you stop by. Of course, you can come to the Pig Roast and talk to folks there…a lot of the volunteers from KCCH will be there along with Donna Payne, our director, and our Board of Directors. We love to talk about KCCH!!! This is our last fundraiser of our 10th year in operation and we would like to have you come and help us complete the celebration!!! We wouldn’t be here without you!